New Theatre presents, THE LITTLE DOG LAUGHED, by Douglas Carter Beane, at the New Theatre, King St, Newtown. 7 February - 4 March. THE LITTLE DOG LAUGHED, by American writer, Douglas Carter Beane, has had a previous outing at the Ensemble Theatre in 2009. The play had been nominated in 2006 for a Tony Award, in New York, and, I, based on the Ensemble production that I saw, could not understand why. It appeared to be one of those New Yorkie glib 'homosexual' plays about the cliche shallowness of being 'gay' and of the cliched ugly strategies needed for surviving in the show business world - especially Hollywood - full of comic 'zingers' and comfortable sentiment. In my past blog I talked about having read the play and having thought there was something more to this play than blithe hilarity to titillate the 'brethren' and the earnest 'progressives' of the New York theatre-going population. So, it was with surprise/relief that this new production at the New Theatre by Alice Livingstone gave a production of the play that was scaled to a naturalistic presentation with characters, venal though they are, that not only scored comic waves of laughter but also some relevant , not necessarily pleasant insights, into the personas of the characters. 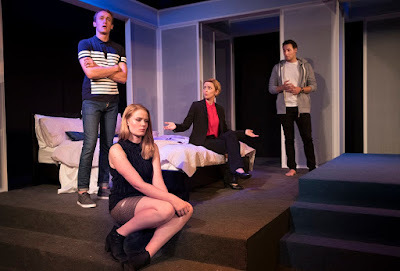 The play is a sweet/bitter pill and wickedly clever enough to claim your attention. This production is part of the Sydney Gay and Lesbian Mardi Gras Festival for 2017. The New Theatre has been part of that Festival for some 20 years and in 2016 was the proud recipient of the ACON Honour Award for Arts and Entertainment. This production of THE LITTLE DOG LAUGHED, is a good quality continuance of that tradition. On a cool grey Set design (Tom Bannerman) that has a simple but elegant style about it, we are introduced to the action of the play by an ambitious agent/manager, Diane (Sarah Aubrey), who has the piercing intelligence of the realities of her industry but with enough wit and élan to seemingly 'float' above it - whatever 'dirt' she plays with, she carries none of the 'soil' of it, or, so it appears. The writing for her character, both as a monologist and as part of the action is where a great deal of the comedy sparkles - as cynical as it may be, it is hilarious in a very 'campy' way. Ms Aubrey, immaculately dressed (Costumes, by Louise Mason), has captured the surface insouciance of this woman wonderfully, who is, truly, anything but carefree or careless when it comes to her client and what he can do for her ambitions. Ms Aubrey reveals the shark-like ruthlessness of this industry with a glamorous edginess that scores a repulse-attract magnet for us audience members, thankfully, safely out of her range of preying. We appreciate, even savour, her cruel wit and are relieved she is not part of our world. Brett Rogers plays Diane's passport to riches and fame, an actor called Mitchell - with boy-next-door matinee looks - who is suffering from a severe need for intimacy as his career begins to take off. His problem is that this intimacy is necessarily requited by men - Mitchell is a closeted homosexual - not a good look for the Hollywood money movie-machine moguls. He has held his mask in place up to now, it seems, until he meets a young rent boy/prostitute, Alex (Charles Upton), and after a false start falls into a state of infatuation that might derail Diane's plans and his super-objective: to be a BIG movie star. Mr Rogers is consummate in his relaxed and languidly handsome performance, capturing Mitchell's belief in what he is experiencing as love but also revealing, ultimately, the spineless unprincipled drive of Mitchell's worldly ambition. He trusts that Diane will protect and guide him, the moral principles, cost, not his concern. He is 'baby' to this 'mummy' figure, indeed. Mr Upton, as Alex, gives a nuanced gamin performance and has enough physical charm and warmth to seduce us into the pull of Alex's attraction circle. It is a charm boyish-enough for us to ignore any signals that his casualness with his bi-sexual relationship with Ellen (Madeline Beukers) that has created a pregnancy and the embrace of abortion, might give us. It is a good performance. Or, am I, too, like Mitchell, infatuated? For, Mr Upton doesn't quite reveal the cynical calculation of Alex that 'rolls' his unconscious drunken victim and then cooly lights a cigarette , while sitting on the bed, and assesses what Mitchell might be able to do for him: Alex is on-the-make, and is always on-the-make no matter his protestations of love (he does protest too much!) - he takes what he is offered, 'bribed' with, without much argument: a cheque for $10,000 and happily escapes all negative consequences of his choices. Undoubtedly, Alex is a grifter, too. Ms Beukers, as Elllen, is attractive and sufficient, but lacks the actor's skill, insight, or courage to show us that her character is not so nice - a selfish opportunist, running with the main chance, whether it be her sugar-daddy's credit card, or Mitchell's wedding ring. No one in this play is an admirable human being. Beware the packaging. The comedy and attractive surfaces of these characters are the definite 'sweet' of this play. Their self-centredness and deep-seated mendacity, their, ultimately, ruthless actions to succeed are the 'bitter' of the play. This production, under the guidance of Ms Livingstone, elevates the play with a cultural maturity that tries to tell, show, a truth of a time and place that needs scrutiny. Obviously, the warning was not heeded in 2006 in New York. Perhaps the 'sweet' comedy was too deflective for the audience to taste, notice, the 'bitter'. Indeed, indeed, the little dog might be laughing all the way to the White House in Washington. THE LITTLE DOG LAUGHED is an interesting and recommended night in the theatre. Just pay attention and don't become infatuated - look below the surface. Mardi Gras 2017!